Building the world’s first 13.3-inch Chromebook may be enough to make this Toshiba important – for the moment, at least. 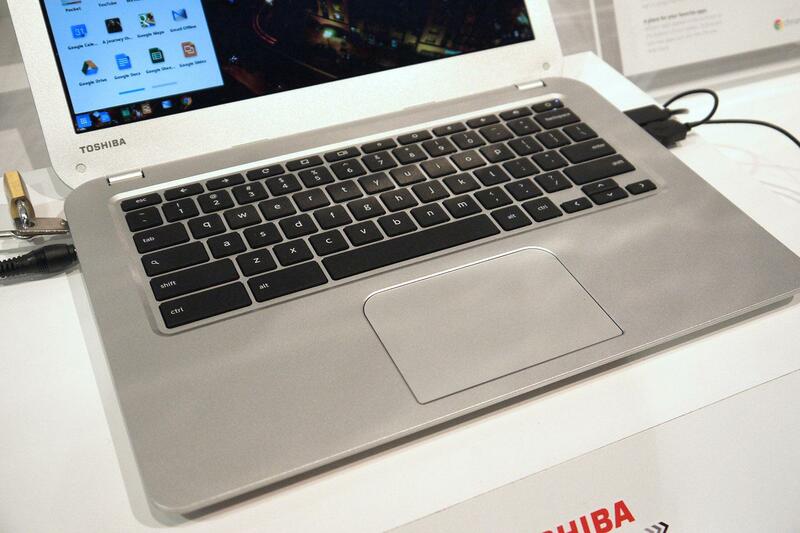 The marketing pitch for Toshiba’s Chromebook is simple: It has a 13.3-inch display, and it runs Chrome OS. Focusing on the dimensions of the screen may seem silly, but the company has a point. All of the options released so far have ignored this popular size, instead going for a much smaller 11.6- or -12.1-inch display or, in the case of HP, a larger 14-inch panel. Toshiba is simply filling a gap the competition has left open. But does that mean it’s worth buying? Our first impression is a tentative yes. There’s nothing about the Toshiba’s specifications that makes it stand out. The Intel Celeron 2955U processor, which is paired with 2GB of RAM and a 16GB solid state drive, should prove faster than ARM-powered competition like the HP Chromebook 11 and Samsung Chromebook, but will probably be just on par with HP Chromebook 14 and Acer C7 Chromebook, which also have Celeron inside. The mediocrity continues to the exterior, which is plain, silver and thoroughly similar to a number of inexpensive notebooks. The 1,366 x 768 display is fine, but not beautiful. Both the keyboard and touchpad do their job, but aren’t exceptional. Even the $279 MSRP is right in the middle of existing options. But that’s the point. While we’ve favorably reviewed the smaller models from Acer and Samsung, a 11.6-inch or 12.1-inch laptop appeals to a limited audience; there are many people who aren’t comfortable with such a tiny notebook. HP’s larger 14-inch version banished that problem, but also inflated the price to $329 (now reduced to $299) and made for a rather bulky package. The 13.3-inch Toshiba walks the line between these extremes. It is large enough for almost anyone to use comfortably, but also small enough and inexpensive enough be justifiable as a second PC for people who already own a larger, more capable system. That’s enough to put it on our radar despite ho-hum hardware. There is one area where Toshiba does stand out, however: battery life. The company claims that it can manage nine hours, while many competitors claim only six. Acer and HP have new models that estimate their life at only a half- hour less, though, so Toshiba must deliver on its figure to truly impress. We won’t know how the battery fairs in real-world use until we have the system in for review. Toshiba hasn’t filled us with desire for its first Chromebook, but it has addressed a popular display size that other manufacturers have mysteriously ignored. Whether that’s enough to crowd out Acer, Samsung and HP remains to be seen.